Bayt al-Aḥzān (Arabic: بیت الأحزان, lit. 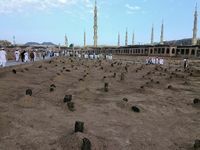 the House of Sorrows) is one of the demolished structures in the Baqi' Cemetery in the city of Medina. It has been said that Lady Fatima al-Zahra (a) engaged in worship and mourned the loss of her father in that place for a period of time. It comprised of a room with a dome on the top and was destroyed in 1344 /1926 by the Wahabbi regime. Bayt al-Ahzan is speculated to be the burial site of Lady Fatima Zahra (a). Many visitors from Medina, especially the Shi'a and Iranians used to visit it before its demolition. The word "bayt" in Arabic means house and "ahzan" is the plural of "huzn" which means grief. The house in which Prophet Jacob (a) (Ya'qub) mourned the separation from his son Joseph (a) (Yusuf) was called Bayt al-Ahzan too; but in historical accounts, this term is used to signify the site in the Baqi' Cemetery where Lady Fatima (a) worshiped Allah and grieved the death of the Prophet (s). According to historical sources and travel writers, Bayt al-Ahzan was situated in the southern side of the grave of al-'Abbas b. 'Abd al-Muttalib in the Baqi' Cemetery in Medina. Accounts reveal that Bayt al-Ahzan comprised of a room with a dome over it and apparently, even consisted of a green wooden shrine. Several Iranian travel writers from the Qajar era have visited this place and have noted its location and details; for example, Hisam al-Saltana Qajar stated that Lady Fatima al-Zahra's (a) Bayt al-Ahzan is located behind the court of the four Imams (a) in Baqi'. Muhammad Husayn Husayni Farahani visited Bayt al-Ahzan during the Hajj pilgrimage in 1302/1885 and said that it consisted of a small dome and a shrine. Haj Ayaz Khan Qashqayi was one of the last people who saw Bayt al-Ahzan before its demolition (in 1344/1926) in the year 1341/1923 and reported it in his travel journal. According to some resources, after the demise of the Prophet (s), Lady Fatima (a) was faced with severe mental tribulations and was distressed with the present situation. Hence, Imam Ali (a) built her a place in the Baqi' Cemetery in the outskirts of Medina so that she could mourn and grieve for her deceased father. It has been said that Lady Fatima (a) used to go to Bayt al-Ahzan during the daytime with Imam al-Hasan (a) and Imam al-Husayn (a); and Imam Ali (a) used to bring her back home at sunset. According to some reports, after twenty seven days of her father's demise, Lady Fatima (a) could not go there anymore due to illness. Sources from Ahl al-Sunna have also pointed out the existence of this structure; for example, al-Samhudi has narrated from al-Ghazali while relating the etiquette of visiting Baqi', that it is recommended to perform salat in the mosque of Bayt al-Huzn; and has mentioned it to be Lady Fatima's (a) place of stay during the period of mourning of her father's death. According to this narration, a mosque was built in this place later. 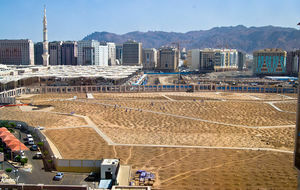 Bayt al-Ahzan is the third probable place where Lady Fatima (a) was buried, after Masjid al-Nabi and the Baqi' Cemetery. Bayt al-Ahzan ceased to exist in the year 1344/1926 after the Wahabbi regime's second attack to Hijaz and the conquest of Medina. The Wahabbis destroyed al-Baqi' in their first attack (1220/1805-6) but some of the structures, such as the Holy Shrine of the four Imams (a), were reconstructed after their defeat. Considering that some travel writers have seen and visited Bayt al-Ahzan during the period between the first attack and the second, it appears that it was not demolished during the first attack, or was reconstructed before the second. Some reports state that in the year 1233/1817-8, upon the command of Sultan Mahmud 'Uthmani, the dome of Bayt al-Ahzan was reconstructed along with the domes of the wives of the Prophet and the dome of 'Uthman b. 'Affan. Haj Ayyaz Khan Qashqayi is amongst the last travel writers of the Hajj pilgrimage and has seen Bayt al-Ahzan in the year 1341/1923-4 and has written a report on it in his travelogue. Bayt al-Ahzan has a special place in the Shi'a elegies. Dreams have been narrated depicting Imam al-Mahdi (a) reciting poetry recognizing Bayt al-Ahzan to be the cause of his perpetual sadness. Bayt al-Ahzan fi masa'ib sadat al-zaman al-khamsat al-tahirat min walad 'adnan by Abd al-Khaliq b. Abd al-Rahim Yazdi. The material for this article is mainly taken from بیت_الاحزان in Farsi Wikishia. This page was last edited on 30 January 2019, at 06:45.